In 2008/2009, U.S. farmers grew nearly 2.4 billion bushels of wheat on 63 million acres of land. In the United States, one acre of wheat yields an average of around 40 bushels of wheat. About half of the wheat grown in the United States is used domestically. 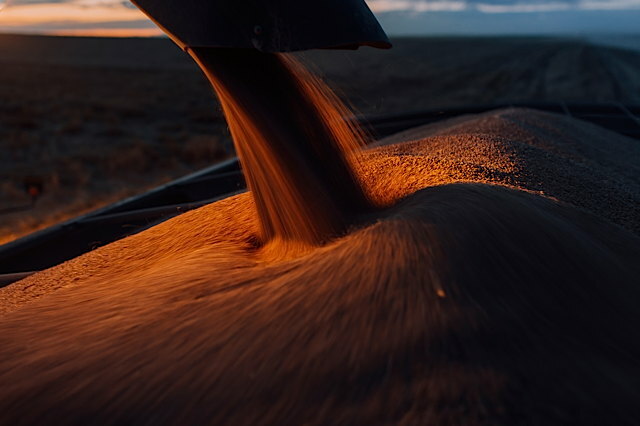 In 2008, the state of Kansas was the largest wheat producer in the United States with North Dakota a close second. Kansas is number one in flour milling in the United States. Kansas produces enough wheat each year to bake 36 billion loaves of bread and enough to feed everyone in the world, over six billion people, for about 2 weeks. An acre of Kansas wheat produces enough bread to feed nearly 9,000 people for one day. For the past year, Elliot Ross has been photographing the world of farmer Jim Mertens. From each one in the hard soil a myriad are spun. Sheaves of gold on bronze in files beneath the sun. The trumpets rising in the dusk? The constant covenant of bread? And clasped by five white fingers of that marble hand. In surveying tombs and gardens that will suit. Of fruit, or fowl, or hunted beast. And it is bread that we would eat. Grown from one, in the harsh soil, our single treasure. The first two photos brought a tear to my eye...beautiful. I've long been suspicious of the fanatical rejection of all things gluten in recent years. It was not a leaf of kale he held up, nor even a piece of lamb (which would seem fitting, if perhaps a little too on-the-nose). No, it was bread. Unleavened, possibly literally just flour and water. Bread that fed West through all its ups and downs. Bread that feeds the world and has no doubt helped make it possible for 6 billion and more to live at once. Bread that the hipsters can't reject fast enough, in favor of some more "natural" and less god-blessed food. Thank God for these farmers, and thank God for our daily bread. The bread of yesterday is fleeting if available at all today. The wheat fields are all green right now, but that will change soon. I like to ride my Sportster just outside of town to see what will soon be oceans of gold. God's bounty and Man's labor bought. While devotion to duty pays the Task Master's bill. From dawn to dusk, from then to now. The wheat of today is nothing at all like the wheat of even a hundred years ago, let alone the distant past. It has been hybridized into a monster that many of us cannot safely eat.